Yes, we willingly dressed like this. It was the call of the cheese. 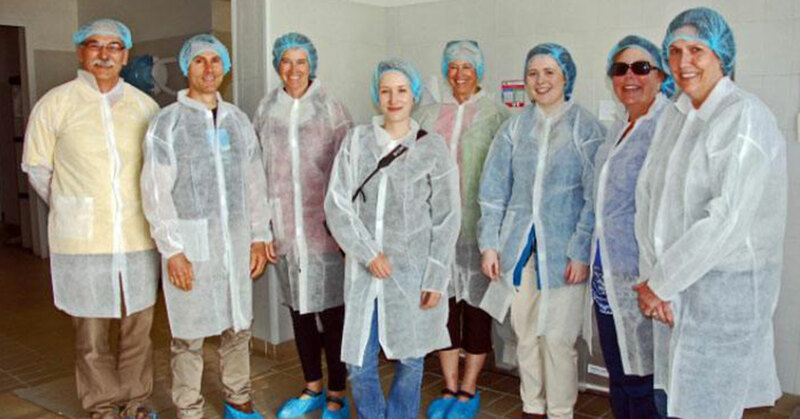 A group from our Italian classes in Lucca had the chance to go north into the Garfagnana countryside, and one of our stops was this family-run cheese-making site. Naturally, we had to suit up to protect the future drool-worthy cheese — from us. But what is so striking in this photo is the Italian sense of fare la bella figura, or always presenting yourself at your best, no matter the situation. Here, when given exactly the same godawful blue hair nets, Kleenex-like jackets, and Smurfy slippers, there is only one of us – the lone Italian — who carries it off, radiating la bella figura. He stands proudly facing the camera with dignity, wry amusement, and with his hairnet deftly fashioned into a jaunty beret. Bravissimo! The rest of us? Giddy amateurs.